/ Uncategorized / Is Affiliate Marketing The Way Forward for 2017? I’ve welcomed in the New Year by finishing a box of @SecretTruffles from The Secret Truffletier (in the lovely grey box above). I received the truffles as part of a hamper gift over Christmas and they were delicious. Full of, yummy chocolates with different flavoured truffles and a magic secret truffle! The secret truffle was of course was the yummiest as it was a surprise. And as someone in JEM Marketing has a birthday very soon and I will definately be asking for some more @SecretTruffles. So it got me thinking about hampers, which are a mix of lovely products all packaged up nicely for the customer. And how they are form of affiliate marketing, where similar products that are liked by the same type of customer are marketing and sold together. I had never heard of @SecretTruffles before receiving the hamper and after a quick Google search I find they are based in England but have an online shop and social media pages. So I can easily send a link to loved ones asking for a reorder for my birthday or to friends recommending the product. Other products in the hamper included @Yorkshire Popcorn which was also very tasty, @BorderBiscuits which are very handy for dipping into a cuppa tea and Barfield Bakery Mince Pies. 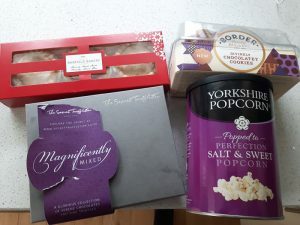 I have liked both Yorkshire Popcorn and BorderBuscuits on social media to keep up to date with their promotions in case I want to buy for friends. I’m very impressed with the hamper as its offered me a chance to try products I’d never heard about and most of them have been quite tasty. And it is likely that I’ll recommend the products to friends and purchase again. A great form of affiliation marketing. But one product was from Barfield Bakery and even though they were nice mince pies I can’t get any more information on their product. Their website is www.barfieldbakery.co.uk but it gets redirected to www.justbrands.co.uk and then I get stuck. I can’t find out any more about the product and I can only assume its mass produced under a big brand which is a shame. Not sure good affiliation marketing. But this is only one product out of many. So is affiliation marketing the way forward for 2017? I think it is. My story above proves that companies if they work together and package their products with similar products in the industry and then they can reach lots of potential customers. By allowing customers to sample new products as a package you are helping raise brand awareness of all the businesses included in the pack and it could result in good referral, repeat orders and increased following on social media. Just make sure your product is well designed with clear information on where it is made and contact details so customers can get in touch. It is also a good idea to work in partnerships with your affiliates to promote the product packages using email marketing and have special offers for companies that you work with in your next monthly e-newsletter. So give affiliation marketing a go today, reach out to a company offering a product similar to you and promote your products together.